If only we could be those 3 and 4 year-olds it would be so much simpler. Instead, for us, a 2017 Pew study found that 69% of Americans say they do not know who they can trust and a 2012 University of Chicago study found that 4 out of 5 people have only some or hardly any confidence in the people running major corporations. There has been no bigger casualty in the culture war than the most precious asset we have — trust. Across virtually all aspects of our society trust has declined, in some cases precipitously. 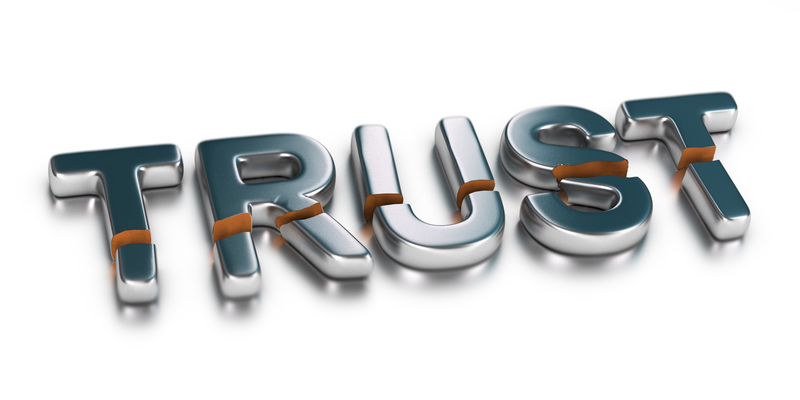 Loss of trust in one area, media for instance, is impacting trust in brands, government, and personal relationships. Loss of trust in government is changing how we perceive what’s true and real. Loss of trust even impacts small things such as how many apps we will use on our smart phone (40% would use more if they trusted the creators). Trust provides the foundation for community and personal relationships. Trust fuels innovation, productivity, and happiness. It matters across all aspects of society and it is worth reflecting on what’s causing the erosion. 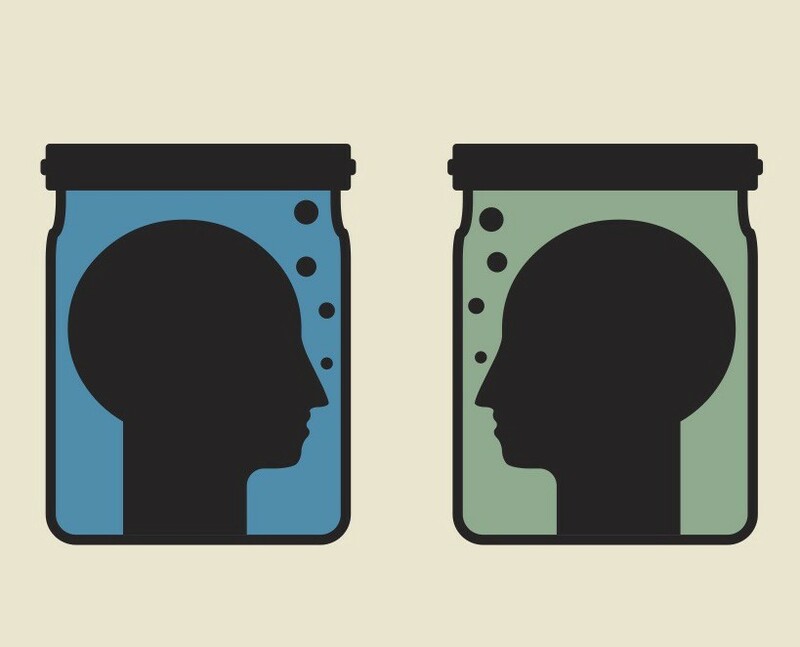 The Neuroscience of Trust found that within corporations the emotional and functional difference between low and high trust environments is vastly different. Low trust corporate environments are described as stressful, divisive, unproductive, threatening, and tense. 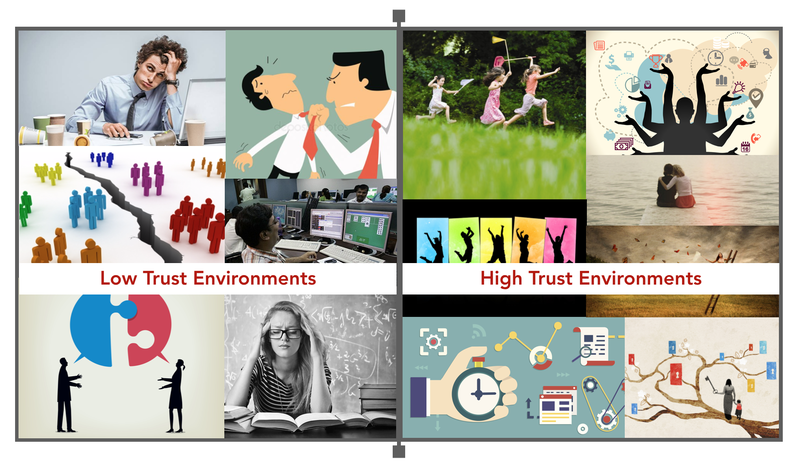 By stark contrast a high trust environment is said to be comfortable, motivating, supportive, fun, and productive. Anyone who has been in a high or low trust environment at school, within a family, or even a club/team can attest that these same qualities are likely just as true outside the corporation. More trust equals more good. The Gollin-Harris survey cited in Neuroscience of Trust found that employees who work in high trust companies have 106% more energy. The same study found that 55% of CEO’s think that lack of trust is a threat to their organization’s growth. Corporations know that trust is critical — that’s why HR develops programs to teach it, teams and managers have outings to foster it, and marketing departments measure consumer trust in the brand. It’s no surprise that it matters within the corporation. But, should corporations care when societal trust is laying in a ditch along a roadside and everyone is just speeding past? It’s okay mom, it’s a metaphor, I’m fine, really. Every corporation, every person for that matter, needs to come to their own conclusions about whether trust is something they can and should try to elevate. Before you do, it’s worth considering the benefits of trust. Social trust is a belief in the honesty, integrity, and reliability of others. But what do you get for it? Quite a lot actually. There is a mathematical relationship between trust and economic performance. Even more, trust provides a mechanism for extended oxytocin release which produces happiness. So, yes, trust matters on an individual, organizational, and societal level. 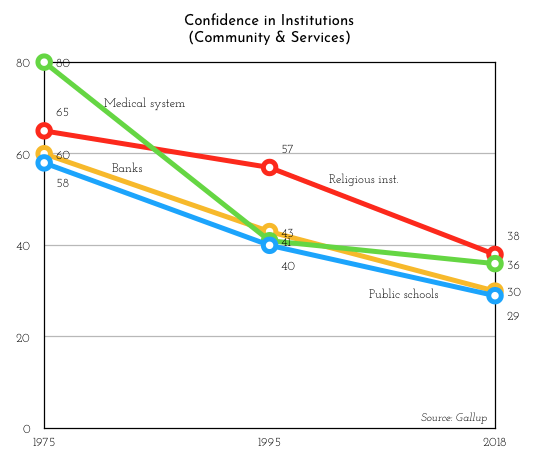 Across nearly all aspects of society trust has been on the decline for decades. In most cases, it’s been a slow and steady decline, though media and congress bucked the slow and steady drop by apparently attempting the thrill of a nosedive. 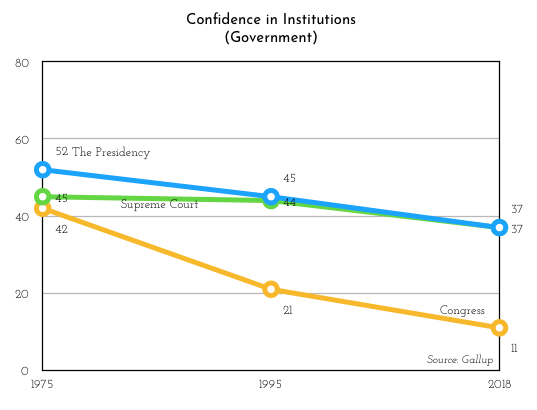 Gallup surveys show that since 1975 confidence in congress has dropped 30 percentage points, from 42% confidence to a mere 11% in 2018. Meanwhile confidence in newspapers dropped 16 percentage points (39% to 23%) during that same period. Not to be outdone by congress, TV news faced the most stunning decline from when they first began measuring it in 1995 to 2018. During this time, TV news lost 26 percentage points, while congress only lost 10 during that same period. A survey by Pew Research found that in 2017, fully 79% of Americans do not have a lot of trust in the information they get from national news organizations. It’s long been said that public trust is a necessary precondition for representative democracy. Though it’s more likely that an openness to trust with a healthy degree of skepticism is what’s really needed. Given that, the government numbers might not be as worrisome if there was trust in our ability to get accurate information from the media. Sadly, there is not. According to a Monmouth University poll, forty-two percent of the public say that traditional news media sources report fake news on purpose to push an agenda. Our trust in social media is not much better. The medical industry has taken an even harder hit in confidence than congress and the TV news did. It’s down 44 percentage points between 1975 and 2018. Schools have taken a dive as well. Though, despite the institutions being in a confidence-decline the people doing the jobs have not been as hard hit. Specifically, nurses and teachers are still among the most trusted people by occupation. Forbes/Statistica found that nurses topped the list with 82% saying they trust nurses. 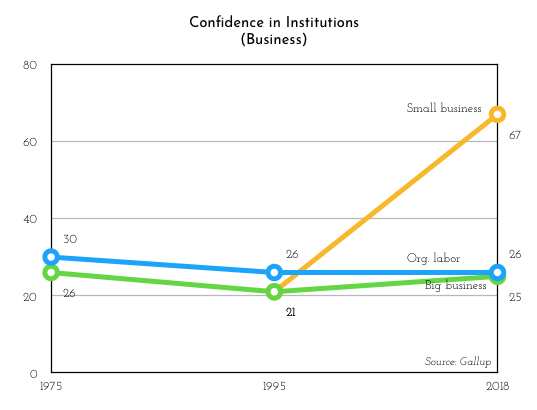 Big business and organized labor have remained at a steady low since 1975 but, interestingly, small business is up 46 percentage points since Gallup began measuring it in 1995. Is that because, like with the individual occupations of nurse and teacher the respondent can imagine an individual person when thinking about small business? Maybe but that doesn’t explain the University of Chicago study that four out of five surveyed in large corporations said they have only some or hardly any confidence in the people running major corporations. Confidence in the military is up by 16 percentage points. 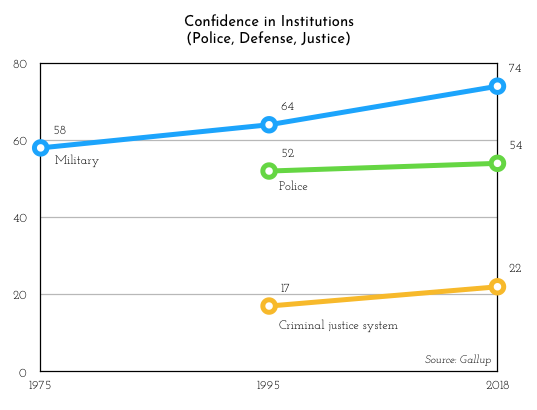 Surprisingly, given social justice activism, confidence in police and the justice system is also up slightly. You’re probably thinking these are measures of confidence not trust, so aren’t you comparing apples and oranges? Yes and no. 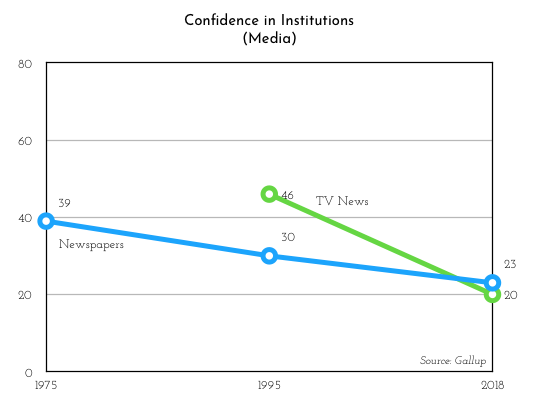 It is a measure of a different attribute but when you find the data for trust it’s often similar to the confidence number (like the Pew and Gallup data on trust/confidence in media). We are using confidence because we simply don’t have the breath of data over time for all of the institutions. Though, if we had the trust numbers we would prefer those. Trust is not a switch you can flip, a small gesture you can make, or an image you can put on — it’s the result of reliability, integrity, competence, honesty, and sincerity demonstrated consistently. By breaking the elements down we were able to isolate some of the specific pressures and tensions that are damaging trust across the different aspects of culture. Right now, most elements of our culture are being stressed. This heightened after the 2016 election but it clearly started to brew several administrations before that. For this article, we’ll keep it brief by focusing on the one or two competing issues within each element. However, a deeper look will be available in a larger report. We outlined above that within broader systems like a work environment, trust fuels economic performance, innovation, comfort, and productivity. We are speculating that these factors translate outside of the workplace and we know that at an individual level trust and purpose create happiness. All good stuff. On an individual level we are bonding more over our shared dislikes than we are on the things that bring us joy. When those dislikes are Coke versus Pepsi we don’t retreat to our Pepsi bubble to avoid the Coke drinker. The article Shared Hatred Helps You Make Friends, based on new research, outlined that people bond more over what they hate than what they like. That means on an individual level we are bonding more over our shared dislikes than we are on the things that bring us joy. When those dislikes are Coke versus Pepsi we don’t retreat to our Pepsi bubble to avoid the Coke drinker. We don’t get angry at the Coke drinker and we don’t want to eliminate them from the planet. We just enjoy the harmless competitive fun of a benign culture war. It’s unlikely that we can say the same thing about the dominant culture wars raging today. Are those wars necessary and will they be healthy and productive in the long-term? Probably, but we don’t know. What we do know is that people are reporting strained family, friend, and work relationships. We know that depression and anxiety are up. Suicide is up. Drug abuse is up. And, we know that social and personal division is high as people retreat to their like-minded echo-chambers. Some corporations are beginning to play an active role in the culture wars. Before jumping onto the battlefield it’s worth asking what role you want to play: tribal warrior, Switzerland, ostrich, translator, mediator, observer, or something else. Whatever role you play, understanding how it impacts trust and relationships is worthy of consideration. A credible and trusted news media has long been held up as the stabilizing element of a healthy and free society. Alas, our current mainstream media garners little trust and it’s getting worse by the day. We have seen research showing that a majority of people get their news from their social media feeds and although Facebook use is declining, it still remains a powerful force. When asked how much social media sites like Facebook and YouTube are responsible for the spread of fake news, 60% say it is partly responsible but other media sources are more responsible. Twitter has been called the battleground of the culture war and it certainly has been elevated as the primary POTUS megaphone. While sixty-seven percent of Americans disapprove of Trump’s use of Twitter because they describe his behavior as boorish, dangerous, insulting, and inappropriate, research by the Public Affairs Counsel found that fully 59% of Americans rarely or never read Trump’s tweets anyway. When it comes to communication, free speech is a core principle that Americans hold as critical. For the most part , we continue to believe we have more free speech than other countries. The problem people have identified is not the legal right to speak but rather the pressures that can make it socially unsafe to question or challenge many topics. 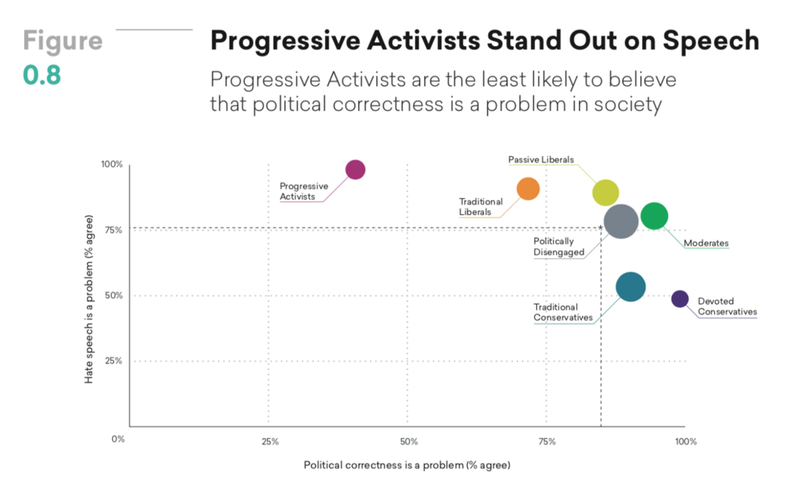 As reported in Hidden Tribes: A Study of America’s Polarized Landscape, a surprising 80% of Americans believe that “political correctness is a problem in our country.” The only real standout on the issue was the group called Progressive Activists (8%) who believe hate speech is a big problem but political correctness is not. This would indicate that much of the political correctness issue is being driven by a very small, but vocal, segment of society. Should corporations play a role in bringing people out of their echo-chambers by helping to make it safe to speak? The average American in 2018 spent 10+ hours a day on some form of media (including smartphone and Internet on a PC) with over four hours spent watching television. Sixty-one percent of Americans say Hollywood has too much influence on American politics and social values. And, nearly 7 in 10 people feel worn out by too much news. It’s worth asking what people will do to escape the culture wars if they can’t get away from it when being entertained? If you ask ten people what the guiding belief system of the culture is you’ll get ten different answers. I know, because I tried. People have a hard time articulating it beyond core U.S. rights or very specific things that are on their minds right now. Concepts like individualism, due process, and freedom were common. So too were ideas about identity groups, equality versus equity, and science versus religion. In many ways these things seemed to boil-down to the issues that are at the heart of the raging culture wars. Most are political though they may not all have started in politics. 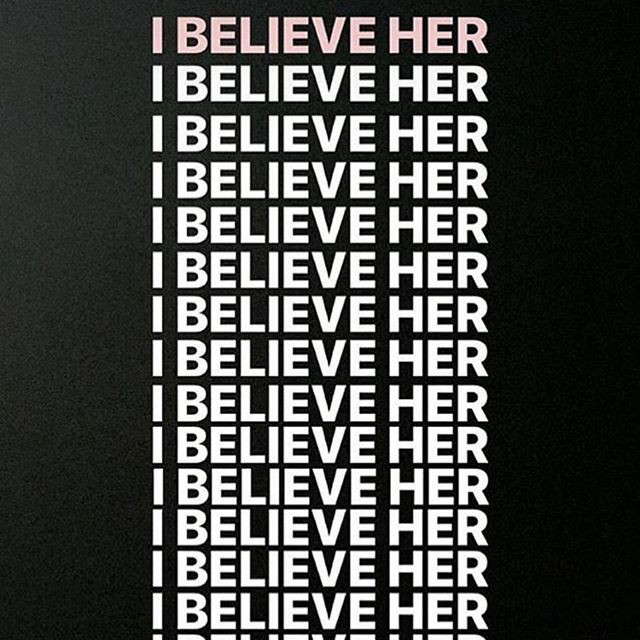 We can look at the #MeToo movement as an example. This has been a long festering societal issue that hadn’t really been addressed and was primarily being fought on Twitter or within aspects of the University. It became politically charged in 2016 and has only gained momentum since. There’s no doubt that tremendous good will come from it. 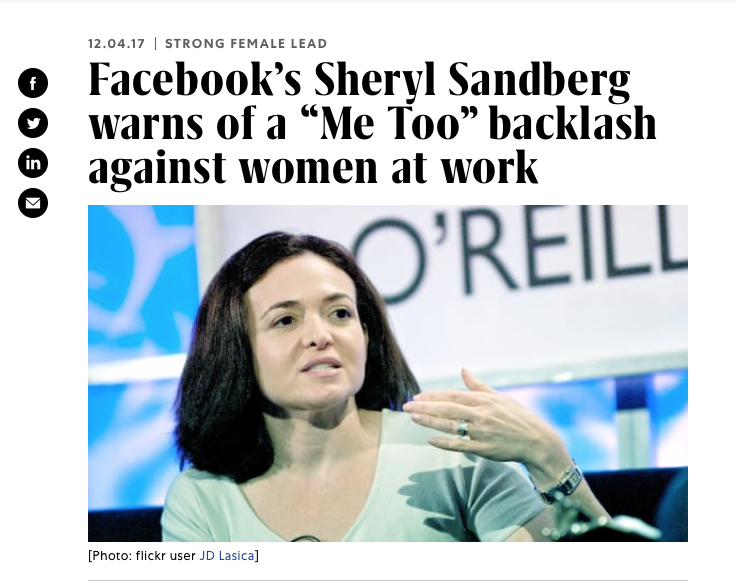 At the same time, it has sparked a level of anger and fear that is creating concerns about a cooperative and productive work environment, due process, divisive stereotypes, and is raising questions about the long-term impact on young boys growing-up in a culture that en masse regards males negatively. 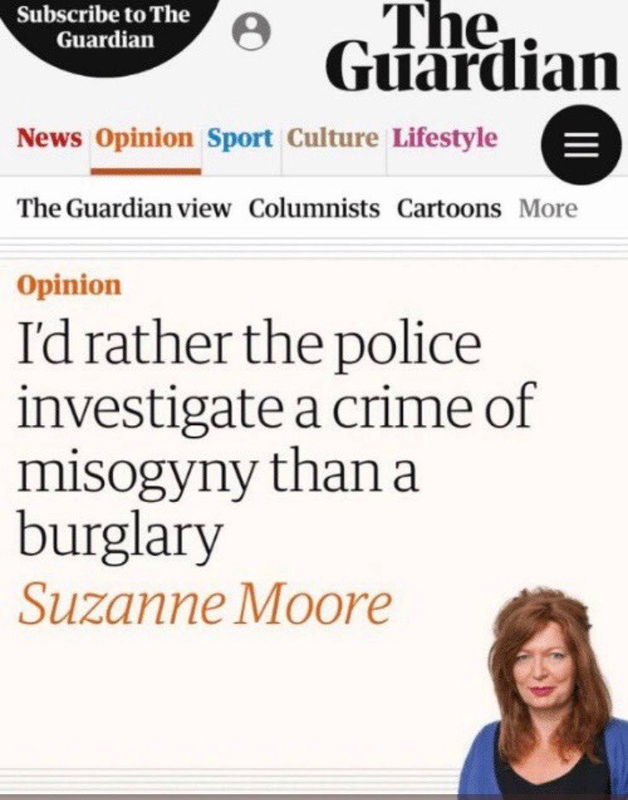 It is also showing us how easy it is to go too far as we start seeing opinion pieces stating crimes of misogyny are more important to investigate than burglary. Would wider and stronger bonds of trust help us maintain our guiding principles AND facilitate the progress that is so needed? Pew Research explored the ideal versus the reality regarding Democracy in America. Of the twenty-three ideals they asked about (free speech, transparency, non-political judges, independent news, etc.) people said all of them were important to the United States. Unfortunately, they said we were not actually doing most of those things very well. We can’t help but wonder if the culture wars are being created by the absence of living our ideals. Or, whether the culture wars are stressing things to the point of diminishing these ideals. Either way, the impact on trust has been tremendously negative. Given the low levels of confidence in the media and government it’s probably no surprise that some are asking for business to move further into the realm of being change-makers. Many describe it as purpose-driven brands. Progressive consumers will welcome the ‘law of the brand’. In 2019, frustrated consumers will welcome LEGISLATIVE BRANDS: corporate interests using their significant power to call for, promote, and even impose laws that drive constructive change and make the world a better place. This trend will likely align most with what we saw about the Progressive Activists studied in the Hidden Tribes: A Study of America’s Polarized Landscape — the 8% calling for social activism. Is this authentic to our brand? Will people think this is corporate-lobbying in disguise? Will people think this is disingenuous pandering? Are we responding to a small segment of the country about something that a larger segment of the country doesn’t care about? We also think it’s worth meditating on the difference between being a purpose-driven brand and a culture warrior. As we said in the introduction, we’re not taking a side in the culture wars but we do believe their potential to spur new perspectives is important. Equally, we think all actions in a culture war should be viewed through the lens of how it might impact trust. In this time of change, there will be unique opportunities for people and brands to take a stand and have a positive impact. Done mindfully, we can solve problems and create trust. Done wrong, well, you know… trust will be found laying in some unfindable ditch along the side of the road. Culture Wars: Introduction can be found here. The larger body of trust research will be available by the end of January in presentation form. The report dives deeper into individual examples of trust stressors across all six elements of culture. Our February culture war investigation will focus on advertising and marketing — it’ll be lighter in both depth and tone than the trust issue.